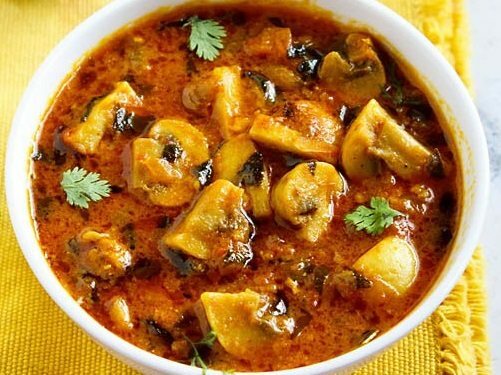 restaurant style methi mushroom recipe - curried dish made with button mushrooms and fenugreek leaves. rinse the mushrooms in running water and get rid of the mud from them. drain all the water very well. chop them and keep aside. in a bowl take ¼ cup curd and a pinch of salt to it. beat the curd till smooth. use full fat fresh curd so that the curd does not split while cooking. add the mushrooms to the curd and marinate for 30 to 40 minutes. meanwhile pick the fenugreek leaves from their stems. soak in water for some seconds so that the mud etc settles down at the bottom. throw the water and again soak the leaves. now rinse the methi leaves well under running water till the leaves are clean and the mud particles are not there. drain them in a colander. chop the methi leaves finely. heat oil or ghee in a pan or kadai. add the whole garam masala - black cardamom, cinnamon, green cardamoms, cloves, tej patta and mace. fry the whole garam masala till the oil becomes fragrant. don't burn them. add onions and fry till they begin to get golden. be patient as onions do take time to get browned. keep stirring the onions in between. once the onions begin to get golden brown, add chopped green chilies and ginger-garlic paste. now add the tomatoes. saute them till they become soft and mushy. keep on stirring the masala. add all the dry spice powders - turmeric, coriander and red chili powder. mix well. then saute till oil leaves from the sides of the whole mixture. lower the flame and add the marinated mushrooms. also add the chopped methi leaves or dry methi leaves. mix again. add about ¼ to ½ cup of water. also add salt as per taste. do keep in mind that some salt has been added to the marination. stir, cover the pan or kadai and simmer till the mushrooms are cooked. do check in between and if the consistency looks dry then add some more water. once the mushrooms are cooked, then check the taste and add salt or spice powders if required. garnish methi mushroom with some chopped coriander leaves. serve methi mushroom hot with rotis or naan. use fresh and full fat yogurt in the recipe or else there are chances of it getting spilt in the gravy. you can reduce or increase the amount of red chili powder, green chilies & ginger-garlic paste as per your preference. instead of oil, you can also use ghee.